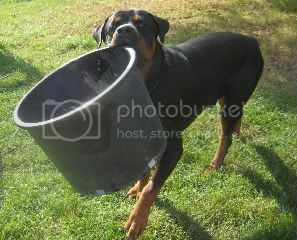 I planted a new shrub and Baloo started carrying around the bucket it came in. Yeah, okay, a new toy that I'll need to take away from him by the end of the day, so I thought. But then he carried it into the house and put it down by the dog food bin. I took it back outside, and he immediately brought it back in, again putting it by the dog food. In case I was too dense, he took his normal sized food bowl and put it in the trash can. he immediately brought it back in, again putting it by the dog food. In case I was too dense, he took his normal sized food bowl and put it in the trash can. Won't you puleeeez feed that poor hungry pooch MORE?! OMG. I want a rotti so bad after hearing all your Baloo stories and seeing that gorgeous boy. I love me a handsome, intelligent man with a sense of humor. LMAO!!!! Baloo is so awesome, what a smart boy. I love hearing these stories Ann!! Now that's what I call a BIG food bowl!! Clever dog Baloo! Too cute! Love that big boy! He keeps ME busy, for sure! Now that I think back, he's been trying to trade food bowls with the other dogs for awhile. His is smaller, but he gets the same amount as the others now. I guess bigger looks better. Last edited by ann_hawes : 09-21-2010 at 10:34 AM.